The poly map tells you which polygons use each vertex, information that is not normally available outside of edit mode. r44864 – Don’t wait for sculpt stroke to create PBVH. r44865 – Add BKE mesh function to update edge/poly hidden flags from verts. r44866 – Add new CCG accessor functions. r44867 – Add MDisps.hidden bitmap. r44868 – Add DerivedMesh.gridHidden and CCGDM implementation. r44869 – Skip hidden elements in PBVH iterator, raycast, and drawing. r44870 – Copy hidden flag to vertices when applying multires modifier. r44871 – Skip hidden elements in PBVH iterator, raycast, and drawing. r44872 – Add partial visibility operator including keymaps and menu items. r44873 – The first, and hopefully last (ha, ha) fix-up commit. Check the documentation on the wiki for usage info. Please report any bugs you find, either here or in the Blender bug tracker. This feature began as an ugly hack back in 2.4x, got rewritten during GSoC, and is finally committed to trunk with support from the Blender development fund. Thanks all for your help and support; there’s more to come! Another update to the masking patch: masking-04.diff. Note that in this update, material colors aren’t working correctly. I’m pondering how best to address this and other drawing problems now. Past couple days I’ve been committing some code cleanups to the non-sculpt drawing code. It’s still a lot of code to wade through, but it’s at least a little less verbose now. 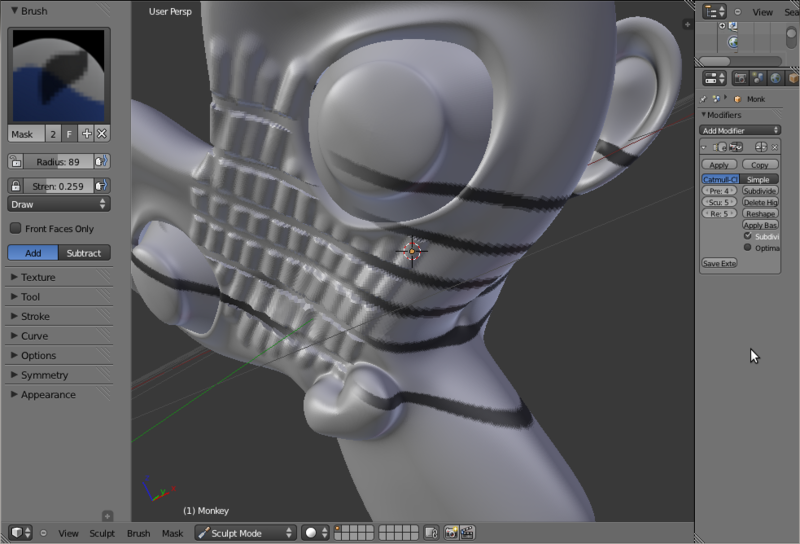 Recently I’ve been committing some improvements to the sculpt PBVH drawing code. None of these changes affect the fancier drawing modes — GLSL and all that is still not accelerated by the PBVH when sculpting. However, there are still some performance and feature improvements. The most noticeable change is pictured at right: materials and shading mode (smooth/flat faces) are now drawn correctly in sculpt mode. Previously, the material and shading mode were set once for each PBVHNode (each of which typically contains thousands of polygons.) 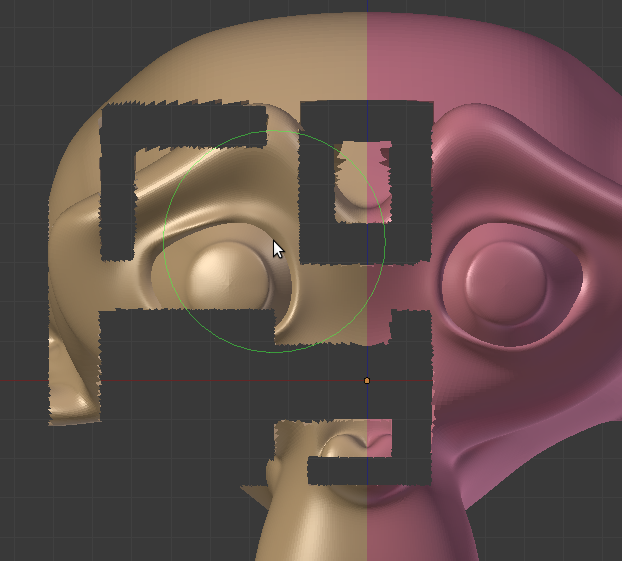 This is still the case, but now PBVHNodes are split until all the faces they contain (whether mesh or multires faces) all share the same material and shading mode. Finally, improvements have been made to use better normals for flat shading. The results should in general look quite close to non-sculpt normals, with the exception of non-multires with VBO.